Hello. My name is Lucifer Morningstar and I… love drugs. Love them! Mmm! Yummy, yummy, yummy. Can’t get enough. And… I’ve got lots of money… mmm, that I love spending on drugs. Not even picky. I’ll do any of them. Mix them together sometimes. Is everything all right, Detective? You seem distracted. Usually, I get at least a glimmer of a smile from my remarks, the occasional eye roll. I think I got a snort once. Devil emoji? That's it. I'm talking to a copyright lawyer today. Permalink: Devil emoji? That's it. I'm talking to a copyright lawyer today. Ella: And besides, I think the devil got a bad rap. Lucifer: You do, do you? Ella: Sure. I mean, what did he really do that was so bad? What? Rebel against his dad? Ask some naked lady if she wanted an apple? 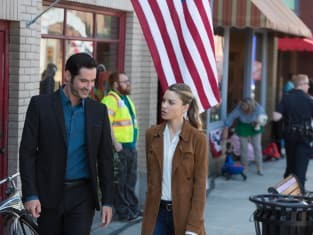 Lucifer: Be still, my heart. Do go on. Permalink: Be still, my heart. Do go on. Oh, wait. Are you a method actor? Permalink: Oh, wait. Are you a method actor? I'm sensing sarcasm and general loathing. Permalink: I'm sensing sarcasm and general loathing. Look at you all broody. Suits you. Permalink: Look at you all broody. Suits you. I'm asking a question. Are our sessions actually working or just making things worse? Permalink: I'm asking a question. Are our sessions actually working or just making things worse? I love drugs. Love them! Yummy, yummy, yummy! Permalink: I love drugs. Love them! Yummy, yummy, yummy! Permalink: Desperation makes for strange bedfellows. I don't know what your deal is, but you make me a better detective. Permalink: I don't know what your deal is, but you make me a better detective.